Analytics: Top Searches, Traffic, and Domains! Analytics are more than just numbers and data pulled together to create fancy line graphs and pie charts. They are bits and pieces of data that when pulled together instead tell a story. 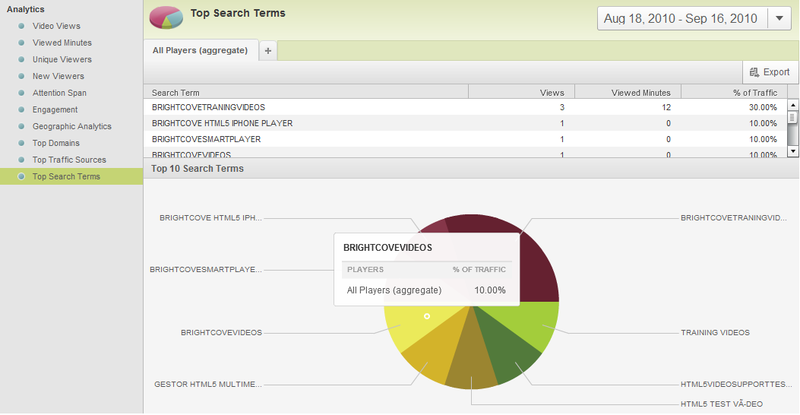 Here at Brightcove we are using our analytics to tell you the story of how users are consuming your content. We weave together character, setting, and plot in order to provide you with the most complete story with the most actionable conclusions allowing you to make confident business decisions regarding your online video initiative. With Brightcove update 4.2.1, we've pulled back the lens farther and allow you to see an even more complete version of your users’ experiences. We've now included the prologue and are helping you answer the question: how exactly are users getting to and finding your content? Check out these new tools now available to you! Ever wonder how people are coming to your content or if a specific source is driving traffic to you? Wonder no more with our Top Traffic Sources tool! There are tons of sites and services that exist on the internet today that have the potential to drive traffic to your video content. There are search engines, social media sites, blogs, etc. Knowing what specifically is driving that traffic is critical to conducting a successful online video initiative. When breaking down this information now provided you can see if a recent viral campaign has increased traffic to your content, see if a new promoter is increasing your traffic, or simply track if people are coming to your site and content directly. With this information you can make effective decisions with regards to the best way to promote or market your content! To date, search engines continue to drive the majority (about 80%) of traffic to websites. Being discoverable through search engines is imperative to increasing your web-based traffic. With our Top Search Terms tool, you now have the ability to see the exact terms that are bringing people to your content. This invaluable knowledge can help you do a number of things. For example, if you notice people are arriving at your content using a specific phrase or set of words, you can use this information to strategically bid on Google AdWords to more effectively advertise your site. Additionally you can also use this tool to coordinate efforts with SEO to ensure that you are as discoverable as possible! Also included in Brightcove's 4.2.1 release is the ability to track the domains your players are embedded on as well as the amount of traffic and views that a particular domain is generating for you. This is a great way to track the performance of the sites you are pushing your players to and the sites that are succeeding in raising awareness of your content and brand. Additionally you can simply track and watch as your videos begin and continue to go viral and know where they are on the web. You Now Have the Full Story! The analytics updates in 4.2.1 have empowered you to discover the entire story of how users are not only consuming your content, but how they are finding your content as well. We've taken all the streams of data and endless numbers of analytics and transformed them into a few easy to understand tools that will help you make strategic and effective decisions with your online video initiative. Whether you need to know what search terms are driving your traffic or rather simply where your content is being played on the web, Brightcove has answered it for you!